I was six years old when my parents divorced. I could not get along well with my father, so I was happy to stay in Tehran with my mother. But since she had to work full time to make ends meet, I often found myself alone. My father used to take me to his home every Friday, which I did not like because he was always too tired to play with me. As time passed, I grew more and more lonely, so I asked my mother to buy me a bird. She did not have time to take care of a bird, she said. She was too busy working. When school started, I felt a little less lonely, but still, I longed for a bird. So, I started to chant a prayer every single night to ask ‘Abdu’l-Bahá to give me a bird. Often, I cried myself to sleep. Then one night I had a dream. I was sitting on a chair crying, feeling lonely and sad, but when I looked up I saw ‘Abdu’l-Bahá standing beside me, smiling at me with kindness in His eyes. 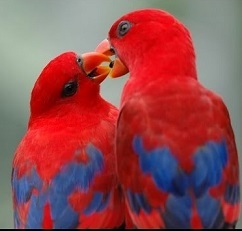 He came closer and closer and then opened His hand to show me what was nestled in his palm — a beautiful red love bird! I wiped away my tears and stared at them both in wonder. He motioned to me to come closer and caress the bird. Then He told me that He would lend me the bird for a few days, but I would have to watch it carefully. My heart was filled with joy and I threw myself into His open arms. When I woke up the following day, I told my mother about my dream. She was surprised and also moved. A few days after I had the dream, a neighbor came to our home to tell my mother that she needed to take a trip. She asked if we could look after her pet in her absence. Would we be able to care for her love bird for a few days? Knowing of my dream and my longing for a bird, my mother quickly told her not to worry — the love bird would be safe with us. When I arrived home from school the next day, I found the beautiful red love bird in my room, exactly the same bird ‘Abdu’l-Bahá had given me. As I opened the cage to stroke the bird, my heart filled with joy and with gratitude to ‘Abdu’l-Bahá for making my dream come true. During those few unforgettable days, I took good care of the love bird, just as ‘Abdu’l-Bahá had requested. Then, to my surprise, after we returned the love bird to our neighbor, my mother bought me a duckling with fuzzy yellow down and shining black eyes! I have never forgotten that at one of the darkest moments of my life, ‘Abdu’l-Bahá came to me in a dream and gave me hope for the future. Since that moment, the love bird has been, for me, a symbol of love and protection. Whenever I reflect on the unexpected gift of the little red love bird, I know that I am not alone; ‘Abdu’l-Bahá is always watching over me. And when I feel hopeless or discouraged, my heart is lightened when I remember the beautiful red love bird that was given to me in a dream. 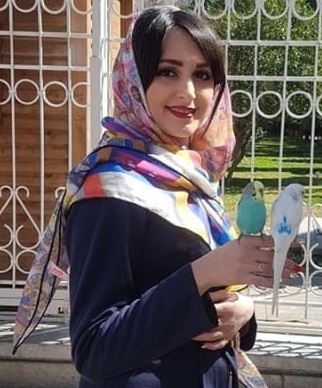 Bio: Zarrin Kasiri lives in Tehran. She enjoys learning and teaching languages. She continues to study English and is now adding French as a third language. She hopes she can one day become an interpreter, translating English to French and vice versa.